April Bake Shop is my month-long focus on all thing baking. Covering brownies, cookies, waffles, and more, I've got you covered. Stay tuned throughout the month to see what I'm next baking up! Want to catch up with other installments in the series? Check out the parent post at this link. Zema's Madhouse Foods is a brand I first encountered at last year's Expo East. Wanting to explore more of their allergen-friendly, superfood-based products, I wanted to revisit Zema's to check out their cocoa teff waffles and chocolate chip cookies. As April is fast leaving, making way for May, one of the final installments in my April Bake Shop series is Ardenne Farm, who is in no way least in going last. I first made their acquaintance at the Natural Products Expo East here in Baltimore, unexpectedly hooked by one downright delicious oatmeal cookie. Locally based in North Carolina, Ardenne Farm is a small company whose reach is growing ever larger as they expand into the southeast and northeast. Finding myself in their backyard during spring break, I made sure to pick up a trio of their mixes for later baking experimentation: oatmeal cookie, chocolate cookie, and fudge brownie. Immaculate Baking Company quickly earned a place in my heart (well, stomach) with their easy-to-make, reliably delicious, and not budget-busting dry mixes. For that review, click here. The fun doesn't end there, though. Immaculate not only has dry mixes for us gluten-free folks, but slice and bake mixes to simplify further the art of baking cookies. At my local Wegmans, and other stores around town, I have been able to seek out their chocolate chip cookie dough and peanut butter cookie dough. Spring is in finally coming to Maryland, but not fast enough in my book! Despite the beautiful blooms on the trees and green everywhere, icy sleet this morning and chilly, whipping winds, brought my too-short springtime revelry to a halt. Wanting comfort food to help me push through the next 20 or so days of my freshman year, I decided to indulge myself on my weekly grocery shopping trip and attempt to recreate a recipe that was among my favorite childhood eats: pesto pasta salad. The beauty of this recipe, is that it can be eaten hot in colder temperatures or cold as a summer pasta salad, and is equally delicious either way. Without a set-in-stone recipe, the dish can be what you make of it, and easily adapts to whatever ingredients you have on hand, and can be adapted to any serving size. Both personal portion and family-sized meals can be made with the same steps, the only difference is amount of ingredients used. Taking a weekend trip home to visit my family this past weekend, I took a week off baking up a storm for April Bake Shop. While there, I loved not having to worry about cooking for myself 100%. My mom, ever on the hunt to find new gluten-free options for me to taste and try at local stores, was excited to send me home with a couple cookie mixes she found at Home Goods. Home Goods (and other similar stores such as Marshalls and TJ Maxx), I've discovered is an excellent source of finding gourmet gluten-free treats at a discounted price. With stock constantly changing, you never know what you'll find, and your wallet will undoubtedly thank you. Ever the oatmeal cookie lover, I broke out the first mix the week I came home, needing a fun distraction from rapidly piling up end-of-term assignments. Besides, with only a month left of school, I have to get started using up the 7 sticks of vegan butter in my minifridge! Simple Mills is a company that is new on my radar, but quickly has become a staple in my dorm cooking rotation. Using almond flour-based mixes that are minimally sweetened and packed with enough protein to power up your day, I love that they are easy to make and taste good too! Already a fan of their muffin mixes (banana, chocolate, and pumpkin) and chocolate chip cookies (see those reviews here), I was super excited to hear about their latest and greatest products yet: a pancake/waffle mix, pizza dough mix, and vanilla cake. Eager to try them out, I couldn't wait to give them a try. With the exception of a super busy spring break, my foodie scouting has been cut short this semester due to winter weather, fighting sickness, and working my way though not the easiest of courseloads. Needing a true "Sunday funday" before the final push to the end of the semester, I took advantage of a a absolutely beautiful Sunday to momentarily flee my scholarly duties and get a bit of foodie therapy. Bought to the inner city to participate in the Ronald McDonald House's Red Shoe Shuffle, I left the event seeking lunch from the previously unknown to me, but highly recommended Lebanese Taverna. Located in prime real estate right on the edge of the harbor in the Harbor East neighborhood, the restaurant promised to merge the best of Lebanese food in a elegant atmosphere to mirror the maritime panoramic it oversees. Baking has quickly become my stress-relieving activity of choice (besides playing with my dog of course). Nothing keeps the stresses of college life at bay than mixing, measuring, baking, and then enjoying the spoils of one's efforts. After a particularly exhausting week of April showers and back to back chemistry and statistics exams (yikes!) I scoured my stash of baking mixes to find the perfect one to ease me into the weekend. Fitting the bill was a dynamic duo from The Half-Baked Baking Company. With the classic chocolate chip mix complemented by it's darker cousin- chocolate chocolate chip, the two were too good not to make at the same time. It's no secret that I am a huge fan of Heartsong Cookies and the wonderfully fabulous baker behind this love-infused brand. Gluten-free, dairy-free cookies are so often a disappointment as they are dry, off-putting, or portioned ridiculously small. Heartsong Cookies challenges the assumption that gluten-free means flavor-free with their thick, chewy, larger-than-life cookies in seemingly every flavor imaginable. 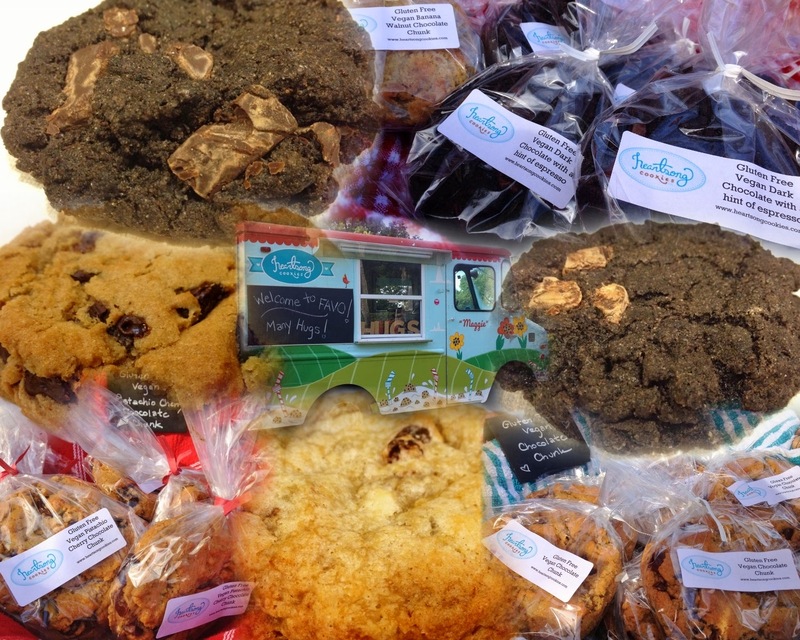 Locally made in Central Florida and found around town at farmers' markets and cafes, Heartsong Cookies are a not-to-be-missed foodie attraction for locals and visitors alike. Starting off my month of all things baking, I selected Moon Rabbit Foods' oatmeal cookie mix as my first product to review. Not a brand I've found at my local grocery and specialty stores, I instead ordered the oatmeal cookie mix on Amazon after craving the classic, homestyle taste of oatmeal cookies. Arriving as fast as the proverbial hare, the mix arrived and was too tempting to sit on my grocery shelf for too long. Wanting to mix up my typical almond butter and fruit breakfast, I decided to bake a batch as an early morning treat. After all, with oatmeal as the main ingredient- they totally qualify in the breakfast department! Just a sneak peak of upcoming reviews. Here in Baltimore, March came in like a lion and left, well, like a lion. With snow flurries on the last weekend of the month and temperatures struggling to rise, I've been chilled by "February in March" and need something to look forward to to make it through the hardest part of the semester. Through several gluten-free expos and my weakness for shopping on Amazon, I've accumulated way too many boxes of baking mixes for sweets and savories of all sorts. Cookies, pizza crusts, pancakes, you name it, I'll be baking it. This surplus of all things baking has me inspired to break into my baking stash for this month's theme on my blog: April Bake Shop. I'll bake my way through the month and share product reviews and recipes along the way. Stay tuned, and feel free to drop me a line with your favorite gluten and dairy free products and recipes via social media!